So it was my birthday on Tuesday and I had the best day! No one needs to know the elderly age I now am (although I am probably the oldest beauty blogger on the block!) but hey, age is just a number right? I thought I would share some of the snippets from my day and some of the gorgeous beauty gifts I received. As you may know my mum and dad have been visiting us in Dubai this week and I absolutely love having them here. Some of my friends sent gifts up to my mum for her to bring over so I had lots of presents to open in the morning. My parents bought me this beautiful sapphire and diamond ring from the jeweller we always use in Dubai. We have been using them for 9 years and they always do an amazing job. I am currently designing a ruby ring with my jeweller so if anyone is interested in buying jewellery in Dubai I might blog about the process. I wear so much blue so this ring is perfect and I love it. 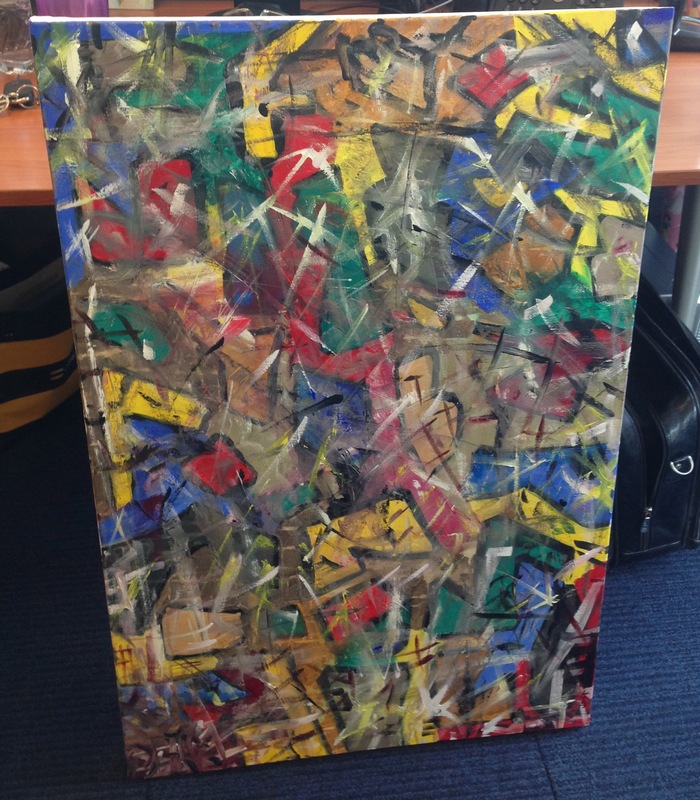 When I got to the office, my assistant James presented me with this painting he had done for me! It's possibly one of the most thoughtful gifts I have ever received and as much as I tease and taunt James 24 hours a day he is literally my right hand man and makes my life so much easier!! I know I won't keep him forever as he is literally a child genius but I have really enjoyed working with him for the past 15 months! I love this painting and we're doing some redecorating so I need to find the perfect space for it. Once James is the King of the World (circa the next 5 years) I will sell it for millions. Halfway though the morning I received this delivery of a huge basket of cookies from my mum and dad! It was beautifully wrapped in a wicker basket with red netting all around it and a mini balloon! The cookies were gorgeous too-everyone in my office loved them! For lunch I went with my team to my most favourite restaurant in the world-Gaucho! My best friend Dani and I go to Gaucho in Swallow St, London every time I am there-it's 'our place' and a ritual. When they opened one in Dubai, right by my office I was overjoyed. I love Gaucho-not only is the food delicious but you're made to feel like a Princess by the very lovely staff and managers. I love the decor and ambiance and just being there. I had a very delicious salmon starter and then steak and sweet potato chips. I 'liked' one of their photos on instagram of their apple and cinnamon doughnuts and they surprised me with a plate of them after the meal. Best thing I have ever eaten. They definitely know how to make a girl feel special. Yes I did taste the sauce before taking the picture lol! In the evening, my parents, Mike and I went to Atlantis Hotel and to Seafire-their steak and seafood restaurant. 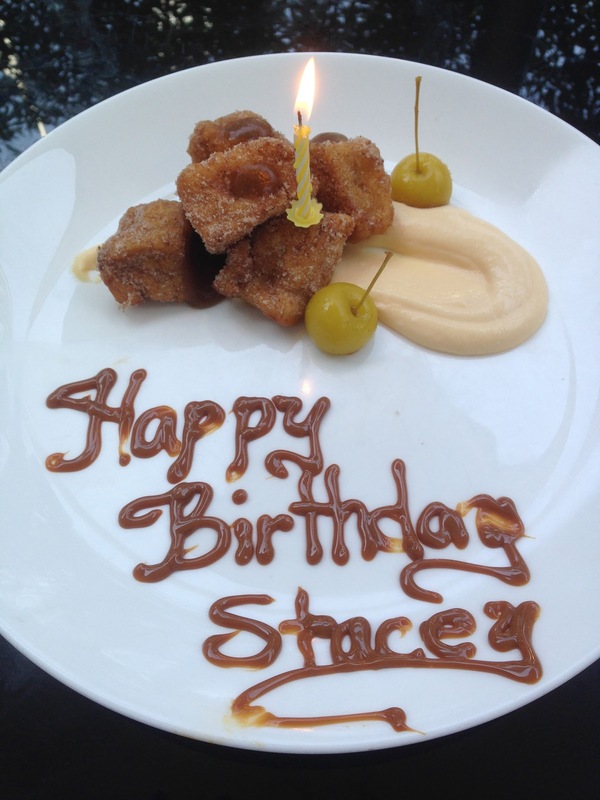 I have always really enjoyed it in the past but it doesn't measure up to Gaucho in the service or the food. I had scallops to start and (another) steak with potato gratin and creamed spinach. There was some nice little touches on the plate like a roasted garlic bulb and a pesto filled mushroom but the quality of the steak at Gaucho was nicer. Seafire is mass market and geared towards the tourists, Gaucho is intimate, special and almost as though you have stumbled on a secret haven. I had chocolate fondant for dessert but Mike chose the dessert of the evening-a Blackberry Alaska that looked like a hedgehog! It was light and fruity and delicious. At the meal my parents gave me a pair of diamond stud earrings, also from our jeweller in Dubai. They are so beautiful, I absolutely love them and was utterly utterly spoiled. Mike bought me a Louis Vuitton Speedy 35 handbag in classic monogram. Here's my wonderful mum and dad in the Atlantis. I know I am the worst person in the world to buy for. Generally if I want something I buy it but I tend to always have a wishlist on my phone. I feel sorry for my poor friends trying to buy for me but the presents I got were all amazing and I didn't have any of them already which is some kind of Christmas miracle!! My mum did cheat a little by asking for my wishlist but sssshhhh! My best friend Danielle bought me Burberry Touch as it's her very favourite. I can't believe I have never smelt it before!! My cats (yes my cats) bought me a bottle of Jo Malone 'Pomegranate Noir'-I obviously need to cut their pocket money! My colleague Ehab bought me this lovely perfume set from Escada-the bottle is beautiful. My colleagues at work also bought me a gift voucher for Sisters salon in Dubai. This is one of my favourite salons in Dubai and I can't wait to spend it! Am thinking a lovely massage after my trip to Cairo next week. Dani also bought me this limited edition 10th anniversary By Terry Baume De Rose gift set containing their legendary Baume De Rose lip balm (so luxe!) and a Darling Baume gloss. 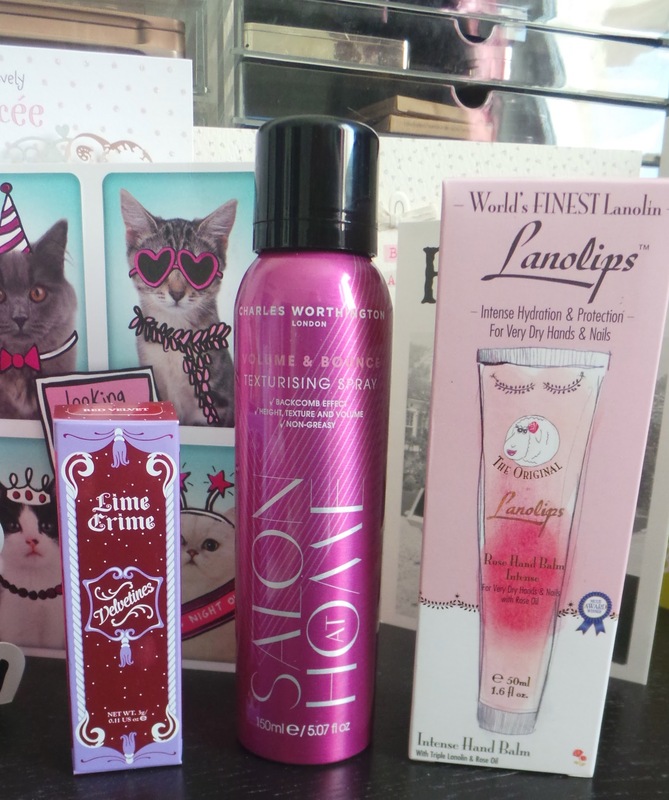 The lip gloss looks amazing-I will definitely try and review these very soon! Vanessa from The Other VW sent some lovely gifts for me to my mum. Along with the below goodies were some lovely chocolate treats (Daim mini eggs-orgasmic). There's definitely a theme with my gifts-beauty, chocolate and cats! Vanessa managed to get me three things I have lusted after but never tried! First up a Lime Crime Velvetine liquid lipstick-I have wanted to try this brand for ages! I have been stalking Boots in Dubai unsuccessfully to try and get my hands on the much raved about Charles Worthington Texturising Spray so was overjoyed to see she had sent me one! I really do neglect my hands so I can't wait to try this Lanolips hand cream. It smells uh-mazing. I love applying rose scented products in the evening because I find the scent so relaxing. My parents bought me this Smashbox palette I have been lusting over for a while. I have seen good reviews and I wholeheartedly believe you can never have too many neutral eye palettes. My best friend Hannah nailed it with her gifts! I utterly love this make up bag-I have seen them around the bloggersphere and think they look so chic. It's the perfect size as well. Cat print scarf-total winner! I am obsessed with my initials-I love having things personalised and monogrammed so this rose gold necklace is just perfect for me! I got 5 new lip products-two off my mum, the Tom Ford lipstick in Cherry Lush (seen on Antonia from Mac and Cheese and lusted after ever since) and the Charlotte Tilbury lip gloss in Portobello Girl. I really bought the Charlotte Tilbury 'Bardot Beige' and loved it so I have a growing wish list. I am really loving very glossy sheer lips at the moment and this is perfect for that look. My friend Sylv bought me one of the new Estee Lauder sculpting lipsticks. I have read glowing reports of this new formula and the colour of this is beautiful-I'll definitely review soon! Finally, Dani managed to get me two Nars lip products I don't own! A satin lip pencil in Timanfaya-a bright orange toned red and a larger than life lip gloss in Bimini which is just the most stunning sheer coral pink. Lastly and off my wishlist my mum got me these two Antipodes products-the Organic Avocado Oil and Rosehip Divine Face Oil and the Manuka Honey Mask. I have read such great things about these two products! Massively massively spoiled and I had a wonderful day! Getting older isn't so bad at all!! I had so many tweets and instagram comments on the day-I felt incredibly blessed and loved so a massive massive thank you to anyone who wished me happy birthday! It really made my day very very special. Hi Im coming to Dubai next month, if possible could you please do a post about jewellery buying experience and where you go to buy yours. Thank you.